A space “revolution”: buy now! Yet another business-media ode to “private initiatives” in space flight has pushed my buttons. I guess Baskin’s never heard the late great Gil Scott-Heron’s 1970 rap, “The Revolution Will Not Be Televised.” I’m offended by Baskin’s warping of this famous line. Wow. NASA is, indeed, “promoting smart, compelling science.” However, asteroid mining and human missions to Mars are first about making money for the aerospace industry – that is, justifying the circa $10 billion a year NASA spends on human space flight programs. And NASA has been talking about human missions to Mars for decades. Publicly. Jeeze. Baskin praises the aerospace industry for “stepping up” – “NASA contractors and suppliers have upped the ante on communications.” They certainly have. I call it “advertising” or “promotion” (and sometimes it smacks of propaganda as well). “Private initiatives” such as SpaceX and Virgin Galactic “are also contributing marvelous content to the emergent narrative” of a new era in space exploration, he writes. I must note that these “private initiatives” are corporations, which exist to make money. Period. True, it’s cheap and easy to do so these days. In my world, however, “the people” means everybody, all colors and classes and net worths. “The People” to whom Baskin seems to refer appear to be largely male and white, and at the top of this heap are a bunch of very wealthy white males. Maybe it’s just me,” Baskin says, “but doesn’t it seem like there are lot of sci-fi movies about outer space coming out of Hollywood these days? If I’m right, it’s because there’s a fertile if not growing audience for the stuff.” It is just you, Mr. Baskin. Science fiction literature about goings-on in outer space goes back at least a couple of centuries, and philosophical speculation about travel and life in outer space dates back to ancient times. The film industry, worldwide, has been chucking out sci-fi/outer-space movies since its beginnings, at a pretty steady pace. “The sociology behind this revolution is fascinating to me,” Baskin comments; “the phenomenon is really distributed and grassroots.” From where I stand, I see a lot of “grassroots” that are actually Astroturf, backed in large part by aerospace-industry dollars. This “phenomenon” is not “really distributed.” It is not, I would argue, meaningful to a broad swath of the global population. “The revolution will be televised,” Baskin concludes. 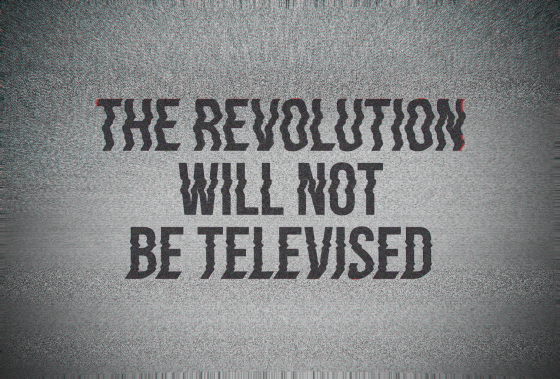 Back to “The Revolution Will Not Be Televised.” Heaven help us if we buy the hype and let the mass media construct an infotainment “revolution” for us. Whoever wrote that item got the message. I don’t know who you are, Penguin Pete, but I’m pretty sure you get it. Linda, I’m sorry you’re so offended by my enthusiasm and support of the exploration of space in general, and the various efforts underway in the US to realize it. And I’m encouraged that you are happy with the efficacy of communications on those points over the past decade or two. From my perspective, they’ve been woefully meager and ineffective, and part of it is probably the result of the lack of public participation in the communicating process (both individuals and for-profit ventures). I’m thrilled that you got my Gil Scott-Heron reference. When he wrote about social change, he was referencing the reality of experience on the streets of America (and in our hearts) as contrasted with the stifled, controlled propaganda appearing on commercial media. That control is no longer true, thanks to the social web and the changes in our culture over the intervening half-century, and it’s so encouraging that 1) the space revolution I see happening WILL be televised, whether on little screens in our hands or on our desktops, and 2) the visual/compelling content will come from a variety of sources, not the experts or those who’ve self-selected themselves as arbiters of that communicating. I don’t know if you’re familiar with the way any other exploration initiatives have happened on our planet over the past thousand years or so, but they pretty much fall into a similar pattern: an organized state funds the initial steps and then private initiative jumps in (much of it for-profit, as well as engaged in science, adventuring, etc.). The second step never happened post-Apollo…we’ve been stuck in low earth orbit space without much public participation, let alone a national mandate…but now I see it happening, perhaps even furtively. The government and a small cadre of experts won’t likely own the conversation going forward. I choose to see it as a net positive for our country. I’m sorry you think otherwise.